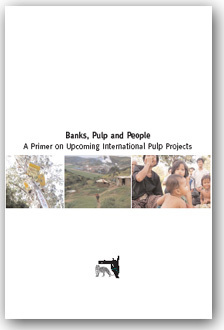 The World Bank’s International Finance Corporation gave a US$50 million loan to Aracruz in November 2004. 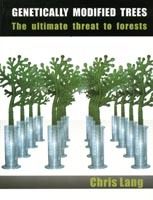 The loan is in breach of the World Bank’s forest policy. 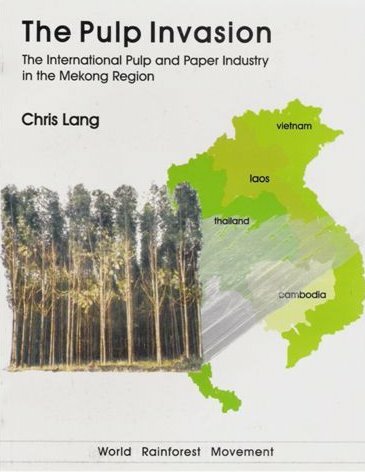 The world’s largest producer of bleached eucalyptus pulp has plans to become even bigger. Last year, Aracruz Cellulose produced 2.5 million tons of pulp. The company is looking at five possible sites to build a new, one million tons a year pulp mill. Over the next two years, Aracruz will spend US$600 million on upgrading its existing pulp mills and expanding its 305,000 hectare plantation area. Aracruz’s plantations were established on the lands of local communities, including those of the Tupinikim and Guarani indigenous peoples. Aracruz built their pulp mill in Espirito Santo on a Tupinikim village called the Village of the Monkeys. In February 2005, WRM received a leaked copy of a report that IFC staff produced to inform the Board about the proposed loan. In the report IFC staff dismissed any criticism of Aracruz: “Aracruz has been the target of allegations concerning its environmental and social practices, typically from non-governmental organizations (“NGOs”) with political or anti-plantation agendas.” IFC staff apparently did not consider it appropriate to worry the Board with awkward facts such as an occupation by the Movement of Landless Peasants (MST) of Aracruz’s plantations which took place in April 2004. IFC staff did not explain to the Board that Tupinikim and Guarani indigenous peoples continue to protest against Aracruz’s conversion of their lands to eucalyptus plantations. IFC staff did tell the Board that they had carried out an appraisal of Aracruz’s “sustainability practices”, which included meetings with “local authorities, community leaders, market analysts and NGOs”, according to IFC’s report to its Board. I asked IFC’s Peter Neame for a list of all the people and organisations that IFC had met during its appraisal of Aracruz. I also asked for notes of the consultation meetings. IFC’s loan is in breach of the World Bank’s forest policy, which requires that “industrial-scale commercial harvesting operations” must “be certified under an independent forest certification system acceptable to the Bank”. IFC has its own forest policy, which makes no mention of certification. 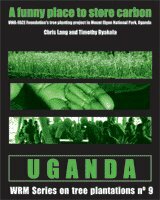 But, according to IFC’s report to the Board, when the World Bank produced its new forest policy in 2002, IFC “did indicate to the Board . . . that it agreed with the certification approach”. IFC staff did not tell the Board that in 1999 Scientific Certification Systems, a Forest Stewardship Council (FSC) accredited assessor, began an assessment of part of Aracruz’s plantations. Aracruz failed to meet FSC’s standards. 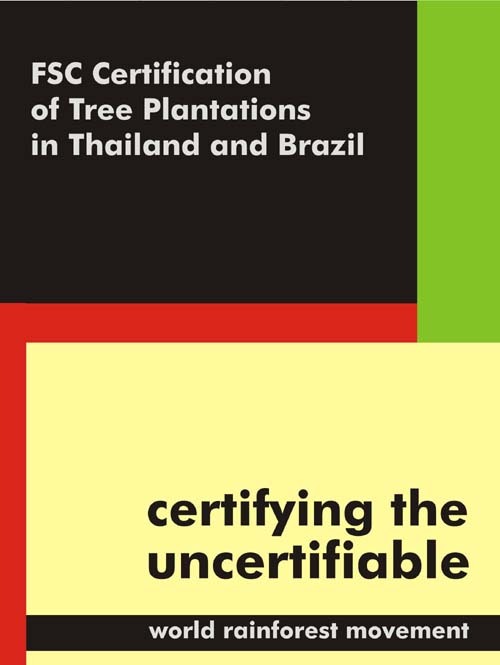 Instead, IFC staff wrote in their report to the Board that Aracruz aims to have all of its plantations certified under a Brazilian certification scheme called CERFLOR. CERFLOR meets none of these requirements. CERFLOR’s standards do not even mention Indigenous Peoples. Aracruz took part in drawing up the standards, but no indigenous peoples and very few NGOs were involved. Rather than specifying minimum performance standards, CERFLOR requires that plans and programmes are in place. CERFLOR’s standards are only available on payment of a fee. 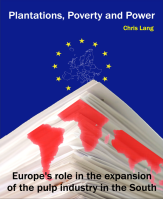 Summaries of assessments are not publicly available. Rather than avoiding conflicts of interest, CERFLOR appears designed to encourage them. Aracruz represents Brazilian Pulp and Paper Association on the Forestry Technical Subcommittee of the Brazilian Certification Committee. IFC commissioned an “independent forestry specialist” to check whether CERFLOR complies with the World Bank’s forest policy. Neame turned down my request for a copy of the consultant’s report. Neame told me that CERFLOR “is generally consistent with the requirements for an acceptable system as specified in the World Bank Forests policy”. To Neame, any problems with CERFLOR are simply “areas in which it could be further improved”. This approach, wrote IFC staff, “can be considered to meet the spirit of the new Bank policy”. But if the World Bank can simply decide that loans need only comply with the spirit rather than the letter of Bank policies, there is little point having the policies in the first place.